Recently, I received an award from – Chopsticks – The One And Only Original Chopsticks Chopsticks Blogger. I am very grateful and appreciative with the award received. (2) Boleh ! Boleh ! Please do drop by the 10 awesome blogs here ! Hey thanks man. It sure felt great to be awarded this triple award twice. Thanks for showing such great support for my blog. Wish you a Happy Lunar New Year! I added your link as one of the people who gave me this award. I think it’s a first for me. 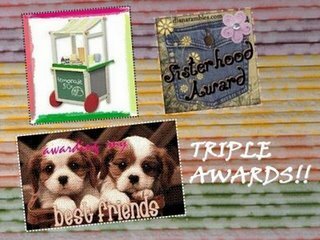 thanks a lot for the award you extended and also congratulations for the triple award you got. hope you have a great weekend. Thanks jinghui for the award! Oh thanks JH, it’s one of the best new year gifts I have received! Tomorrow is the New Year’s Eve, How will you celebrate it? Well done on your award. What I really want to say is…..I really do adore the two puppy dogs in the photo, top banana. Like the look of your site. this is an interesting award. it’s a great way to share the “love”! I deeply appreciate everybody well wishes, blessings and comments here ! Wish you all the best in your blogging !